Every year since 1902 car racing has been an event that has drawn thousands to this town called Daytona Beach. Way back in 1787, the area was used to grow citrus crops that were near the large sugar cane plantations. In 1886, the St. Johns and Halifax River Railway arrived as part of the East Coast Railway. This was when the four separate towns, Daytona, Daytona Beach, Kingston, and Seabreeze merged as Daytona Beach. By the 1920's it was dubbed "The World's Most Famous Beach," where the "Road Course" became famous as the location where fifteen world land speed records were set. Daytona Beach is located at the Halifax River off of Florida's east side lying in a section of the Intercostal Waterway. It was initially inhabited by the indigenous Timucuan Indians, who were eventually eliminated through enslavement and disease. What made this area ideal for racing was its hard sand beach that ran for miles. Beaches that are still open to cars to drive, not to race on and they are now dotted check to jowl with hotels and restaurants. It's hard to comprehend that what is now the most famous speedway in the world once started out as a place on the sand for souped-up street cars to race. It's also interesting to observe how a woman from the midwest ended up working for the Speedway for ten years. Gail Garlinghouse spent her high school and college years in Illinois. While attending Kendall College, she joined a sports car club. In that club, she met Ernie Rysso, a fellow club member. Ernie Rysso was a product engineer at the time. As his career moved on, he became a product manager, running the marketing department for such large companies such as International Harvester, and Hayes Albion. They were transferred several times, and they finally settled down for sixteen years in New Hartford, New York, a suburb of Utica. Eventually, Gail's parents moved to Florida. Like so many sandwich generation people, they moved to Florida to take care of the parents. Their only daughter, Jennifer, moved too. When mom and dad both died, they stayed in the state, not missing the cold and the snow of the north. Gail looked for a job and finally found one with NASCAR, but she was not a racing enthusiast. Actually, it was Americrown who employed her. Americrown being the division that takes care of the food, beverage, and merchandise sold outside of the thirteen tracks countrywide. NASCAR (National Association Stock Car Auto Racing) is a private organization and the governing body of the sport of racing. 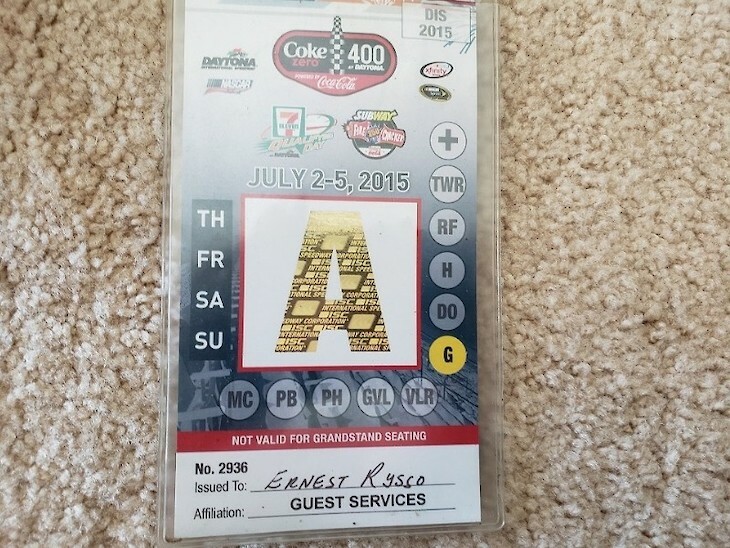 The International Speedway Corporation is a publically held organization, and Americrown is a division of ISC. Gail's job was in the Credentials Department for Independent Contractors. 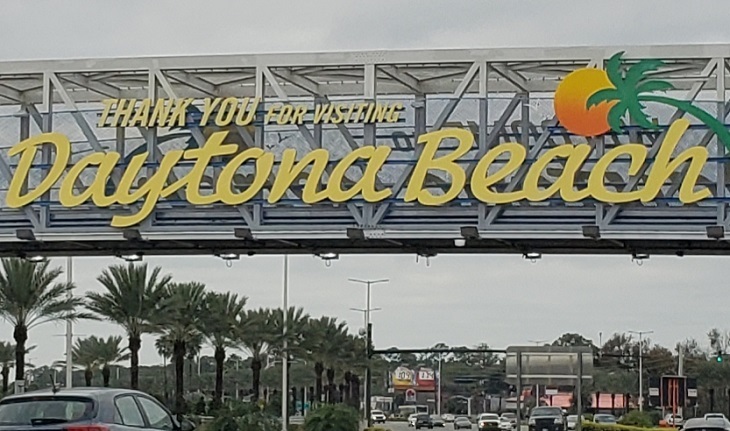 Which means, it was her job to validate groups or individuals whose workers were over eighteen years old and were able to sell food, beverages, and merchandise at the races; and there are lots of races, and lots of venues; one hundred and fifty vendors at Daytona alone. Many of the vendors are church groups or Boy Scouts or others that use the event to earn money for their cause. Vendors come and go, but the fans must be fed, beveraged, and sold merchandise, and there is always the push to fill the vendor gap. 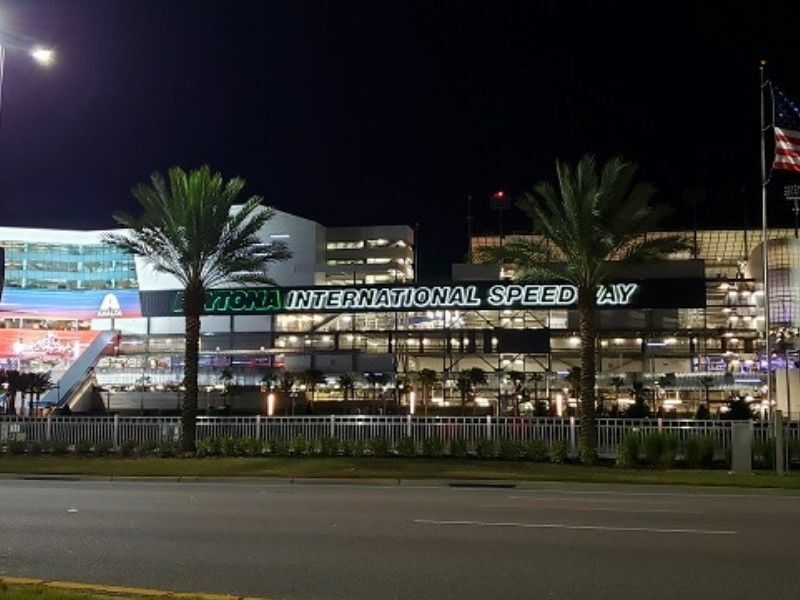 In January the Rolex 24 Hour Race opens the season with Ferarris, Lamborginis, Porsches, Corvettes and Cadillacs racing for twenty-four hours straight. The thunderous vibrations of the Rolex, as well as all of the other races, can be heard and felt for miles. The Budweiser race starts three weeks later with stock cars like Fords, Chevies, Dodges and Toyotas. A week later the Daytona 500 is run and then in March it's time for Bike Week where motorcycles take their turn on the track. In between the big races are lots of other races, and the noise doesn't decrease until the end of November when the monster trucks perform. The Big Banquet Blow-Out is held in Las Vegas this year on November 28. This event is held to crown the 2018 Monster Energy NASCAR Cup Series Champion. Racers and everyone else take off the month of December, and then in January, it all begins again. The mammoth speedway, which was built in 1959, is a mile long on each side with a quarter mile on each end connecting them making the track two-and-a-half miles long. The Daytona 500 means that each vehicle races for 500 miles, going as fast as 200 miles per hour That's 200 laps of left turns. It can also pay out one million, nine hundred thousand dollars to the winner. Out of the forty-five cars that run it, each vehicle wins something. There are always wrecks and lots of caution flags: a green flag starts the race, a yellow flag is for caution on the track, and a red flag stops the race. The black and white checkered flag indicates the winner. Each year, an annual sell-out of over 200,000 fans show up for the race. Parking can cost as much as fifty dollars, and even if it's raining, umbrellas are not permitted. Only small coolers can be carried in, and backpacks have to be see-through. There's a 'selfie' parking area not fully inside the gates in the front so if you want to say you were there, and really weren't, you've got the photo to prove it with the colossal Speedway sign behind you. The Daytona Speedway is going the way of many large venues, like State Fairs, and often rent out their massive parking lots for RV shows, boat shows, and concert series. It's a favorite place where local Car Clubs come with their own car shows, often displaying six to eight thousand cars. This year was the second year of the Christmas Lights Display which was a drive-thru viewing with a twenty dollar per car admission charge. As Daytona Beach and the surrounding towns grow, it won't be long before it will become desperately over-crowded, like so many tourist towns. But fans will line up with tickets to the races with their bottles of sunblock and pillows for sitting. As for Gail, she's retired now. Ernie worked for his church's vendor stand for a couple of years, and then worked as a volunteer wherever needed, and he is now retired, too. They live in a gated community full of palms and streams and ducks. Life is good. 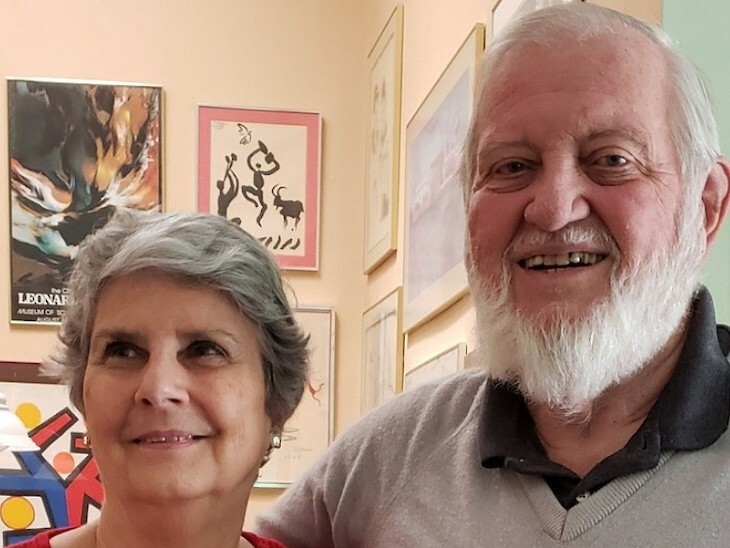 As for her memories of the first time she attended a race; "The first day I worked, and we were finished with our job, my co-worker took me out to the track, right down to the closest place possible to watch my very first race. I hardly saw the thirty-two cars as they sped by as fast as lightning, but when I looked down, I realized I was covered in mud and dirt. That was the last time I ever attended an event, even if it was free for me."